Basé sur des témoignages de survivants, le film raconte l’histoire de Rwandais qui ont résisté à la haine durant le génocide de 1994, faisant des mosquées des lieux de refuge pour Musulmans et Chrétiens, Hutus et Tutsis. ACTEURS : Edouard Bamporiki, Cassandra Freeman, Cleophas Kabasiita, Hadidja Zaninka, Kennedy Mazimpaka, Hassan Kabera. Based on accounts from survivors, Kinyarwanda tells the story of Rwandans who crossed the lines of hatred during the 1994 genocide, turning mosques into places of refuge for Muslims and Christians, Hutus and Tutsis. 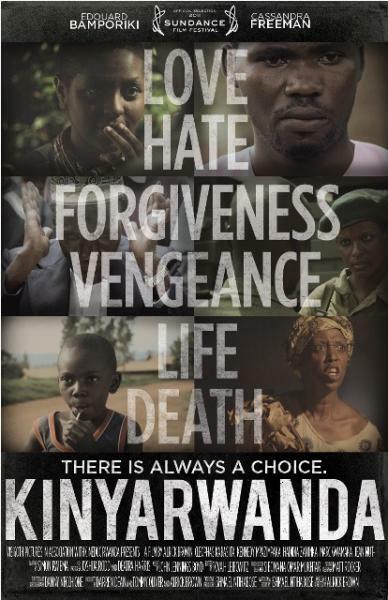 Fresh, insightful, and profoundly moving, « Kinyarwanda, » the first dramatic feature film conceived and produced by Rwandans, is an extraordinary telling of the 1994 genocide that expands the common victim/perpetrator narrative to illuminate the complex fabric of life during the tragic event, and the even more complicated process of redemption in the truth and reconciliation process. Director/writer Alrick Brown and cowriter/producer Ishmael Ntihabose elegantly interweave six stories based on true accounts-a Tutsi/Hutu couple, a small child, a soldier, a pair of teenage lovebirds, a priest, and an Imam-as they are affected by the Muslim leadership of the time. Little is known about how the Mufti of Rwanda-the most respected Muslim leader in the country-forbade Muslims from participating in the killing of the Tutsi. As the country became a slaughterhouse, mosques became places of refuge where Muslims and Christians, Hutus and Tutsis came together to protect each other. « Kinyarwanda » plumbs the shades of gray to find humanity in every perspective and offers a rich understanding of what it means to survive unimaginable terror, and the astounding resilience of the human spirit to find ways to heal and forgive. [Synopsis courtesy of the Sundance Institute].